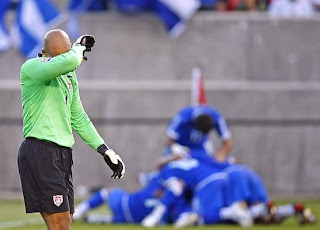 Futbol USA: US vs El Salvador: Lessons learned? Having seen the highlights it seems the goal they took away may have been a makeup call for the missed offsides on the first goal. Unless I misunderstand the rule off a direct kick, they had about four guys offsides when he struck the kick. And if I am wrong, why did El Salvador play what appeared to be an offsides trap there. It's a trick play. El Salvador played the offsides, effectively negating 4 US players. The trick is that these players are meant to do this so that another player (Dempsey) runs in from behind, outside of the area, in an onside position. This was well done by the ref. Jozy's annulled goal was (1) not offsides by a long shot, Jozy was a step back from the defender. (2) Dempsey did not foul the guy as he made the pass, the defender simply tripped over him. 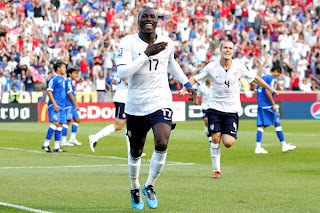 (3) It may be that Jozy fouled the Salvadoran. 3-1 would have been the score. Could have used that +2 GD.